(CNN) -- President-elect Barack Obama's victory speech Tuesday night compares favorably with a number of historic orations, a linguist said Thursday. 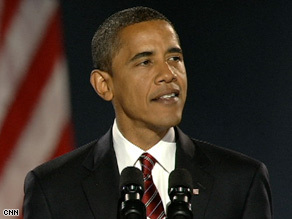 Barack Obama speaks at a rally in Chicago, Illinois, after winning the presidency Tuesday night. "His goal was to be understood by the widest possible audience during his victory speech, and he seems to have done a great job doing it," said Paul J.J. Payack, president of the Austin, Texas-based Global Language Monitor, which analyzed the speech for content, tone and length. "He's at his best communicating directly and forthrightly with this audience and using different types of rhetorical devices," Payack said, noting that the speech was written to a seventh- or eighth-grade level. That's lower than the Rev. Martin Luther King Jr.'s 1963 "I Have a Dream" speech (grade 8.8), President Reagan's 1987 "Tear Down This Wall" speech (grade 9.8) and even Obama's own 2004 Democratic Convention speech (grade 8.3), Payack said. In the four years since then, "he has learned to speak more directly and more succinctly when he's giving a major address," the word aficionado said. He spoke admiringly of Obama's repeated use of the phrase "Yes, we can," calling it "very effective." "That's a very short, direct sentence," Payack said. "Almost like a drumbeat hammering into people's minds and hearts." He added, "something like that comes across as a very effective rhetorical device." That phrase compares with Reagan's "Tear Down This Wall" and President Kennedy's "Ask not what your country can do for you; ask what you can do for your country," delivered in his inaugural speech. Twelve of those words were "hope" or variations of the word, which indicates optimism about the change (used nine times) he has promised to effect. Another 23 of the words were "will," another way of making the speech forward-looking. But the vast majority of the hopeful references were in the active voice, he said. "It's very personal and very active. 'I promise we, as a people, will get there.' "
The speech was notable for what it omitted, too, Payack said. In this case, the absence of a reference to the September 11 terrorist attacks indicates a change in tone, he said. In his closing phrase, Obama repeats the mantra, "Yes, we can," which serves as a call to action, an acknowledgment that the country faces hard work, Payack said. Obama is saying, "I'm asking you to do something big, but we can do it together," Payack said. "We are the change; we are the hope."